During the winter months some of the most popular things to do on vacation are skiing and snowboarding. With so many resorts to choose from in Denver here are a few that you can learn more about. You might be wondering which Denver ski area to visit on your trip. Below are a few examples of popular ski resorts for you to choose from. Shuttle services from Denver International Airport are available for those wanting private vans for larger groups heading towards the mountains or shared ride vans if you are seeking a more economical way to travel. DEN airport has so much land that there is no other airport in the United States that comes close. 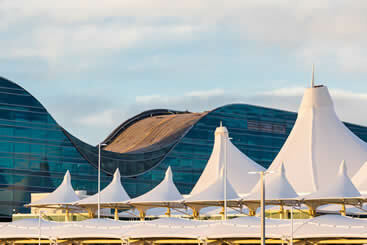 With over 30,000 acres to grow Denver International Airport has a lot to offer its travelers. The airport is easily recognized by the tent shaped structure above the main terminal that resembles snow capped mountains. Travelers who fly into the airport can get to many of the ski slopes and resorts nearby such as Winter Park which has a snow average of over 300 inches, Keystone Ski Resort which is managed by Vail Resorts, for activities throughout the year Copper Mountain is a great vacation spot and Breckenridge which was once a mining town but now a popular ski resort. Travelers can find non-stop exclusive van service from SuperShuttle for private vans or if you are on a budget shared ride vans to downtown Denver or the surrounding area. Offering SUV and sedan rides, ExecuCar providers black car service to passengers looking to travel in a private car with more luxury and style. Near the Denver International Airport travelers can get airport transfers to hotels like the Hyatt Regency Denver which is located near the Colorado Convention Center in the popular visitors spot in the LoDo district. The LoDo or the Lower Downtown Denver, has a lot of history for its area and is where the original settlers of the city established themselves. Travelers can get DEN airport rides from Shuttle Limo Service and with SuperShuttle, commonly known as Blue Van, to the LoDo by shared ride vans or for groups with more passengers to transfer can do so with private shuttle buses. DEN Airport is probably the largest airport in the US. It is an international airport with flights coming here are from all over the globe. On the inside, you will find beautiful wall paintings and arts done by some of the most famous artists in the state. Due to the huge demographics of the city, the airport is a bit busy so you should come here early to avoid missing your flights. The state of Colorado is present in the central parts of the US. It is highly famous for its thick forests and the diverse wildlife within. Countless national reservations and wildlife sanctuaries are present here due to which you will find people coming to this state from all over the world. In the beautiful state of Colorado, the city of Denver holds an important place. It is huge city, one of the biggest in the state, and hosts millions of people living in it. It is famous not only for its economic contribution to the growth of the state but for adventurous activities as well, it has on offer. Hiking, camping, trophy hunting, and skiing are some of the many thrills offered by this place. The city of Denver has totally different scenes at its two ends. On the eastern side, you will find manmade architect and buildings while on the western end all you will witness is wildlife sanctuaries and forests; with Pike National Forest, Roosevelt National Forest, and Rocky Mountain National Forest being the most famous ones. Leave Denver International Airport in relaxed comfort by hopping aboard your amazing getaway vehicle our local providers such as SuperShuttle. Whenever you schedule a shared ride van from the company, you’ll be able to get to your hotel in no time and with hardly any cost thanks to the many deals offered. Be sure to call ahead of time and ask if there are any that apply. Share a private van with nobody except the ones you love the most and get to your destination quickly by avoiding unnecessary stops. Whether you’re trying to check out a fun game at Coors Field or trying to get a day’s worth of interesting facts from Denver’s many museums, including Denver Museum of Nature and Science and the Denver Art Museum, you’ll be sure to see everything and more by booking a private van today. Reserve your very own private sedan, courtesy of our local providers, and take a spin through Colorado’s famous capital. Visit areas of the Old West by checking out historic locations like Black American West Museum, which features many exhibits and artifacts on black frontier history. Another great place to enjoy the intimacy of your car is Cherry Creek State Park, a recreation area made perfect for scenic drives and outdoor hikes. For groups small and large, the best and by far the most comfortable choice of transportation is a private SUV. Contact us to book your own set of wheels and avoid having to wait for public buses or stops you don’t agree with by having everyone ride to Berr Lake State Park, a beautiful area filled with hiking and bird-watching. Another fantastic location worth visiting is the Grant-Humphreys Mansion, a historic building that offers daily tours and a look inside the old world. If you’re the type to enjoy elegant things, don’t deprave yourself – visit Sushi Den, the hottest Japanese restaurant in town, and get there in absolute luxury by booking your own stretched limousine. Stay out for drinks at JW Marriott’s upscale cocktail lounge and stay in one of the facility’s beautiful rooms for a nightcap if you’re feeling adventurous. Massive groups are more than welcome to the city of Denver, but that doesn’t necessarily mean transportation is willing to oblige. Get around town efficiently by having your extra-sized fun at roomy places like the Denver Zoo, which houses a variety of interesting exhibits and live shows. If your group is looking for an extra punch with their adventure, take the bus to the 69-acre Elitch Gardens, Denver’s premiere amusement park. Denver is filled with outdoor activities and things to do with the family throughout the year. Explore Visit Denver and learn about the fine restaurants, hotels and places to visit during your stay in Denver. Denver is filled with some amazing outdoor event throughout the city such as thrilling skateparks or taking a day to experience the fun at Red Rocks featuring shows throughout the year. You can even head towards the thirteenth step while you are at the Colorado State Capitol building and feels what it is like to be above sea level exactly one mile up. Loveland is located about 50 miles from Denver and has lots of ski resorts choose from. This ski area runs along side of Continental Divide. You can have fun with the free snowcat skiing this area. This ski area has it all complete with dining, wedding venues, lodging and a park. You can view their ski trails and discover the details of the slopes and terrain before you go so you can choose which one you’d like to explore. With 75 years of history and happy skiers this location is popular among avid skiers and usually gets packed with snow each year. You can even try the well known Mary Jane Territory section that will give you a very bumpy ride. About twenty miles from Boulder, Colorado this ski resort is great for not only cross-country skiing which is almost three miles long but also those who want to hike in snowshoes. When it comes to organized ground transportation and timely flight schedules the Denver International Airport does a great job of making the travel experience and the environment less stressful. Located about half an hour from downtown Denver passengers can get to their destination quickly so they can enjoy the city during their stay. Dallas airport rides can be found throughout the city for shared ride vans and private sedan services. Some of the most popular providers include Discount Shuttle & Car Service, SuperShuttle who offer many vehicle types for every occasion including their ExecuCar which have an all inclusive SUV and sedan service with professional drivers who can tend to your travel needs. With so many hotels to choose from in Dallas there are some that are worth mentioning. Many travelers come to stay at the Warwick Denver Hotel each year which offers great service and a luxury experience. If you are with a large group for a local event the the Hyatt Regency Denver At Colorado Convention Center which adds a convenience for those needing to get airport rides to and from their exhibit with vehicles like private shuttle vans or SUV transfers. Dallas has a lot to offer visitors when it comes to places to eat. You might want to take a night off and relax at the Fruition Restaurant and for unique styles of pizza then Rocca’s Pizzeria Napoletana may be one you may not want to pass up. There are many things for families to do while they are in Dallas. If you have a love for local museums then you may want to spend a day at the Denver Museum of Nature & Science as well as the Kirkland Museum of Fine & Decorative Art.